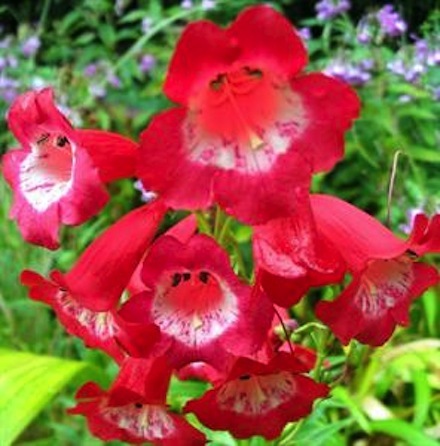 Penstemons are incredibly easy to grow with just a little care and attention required from time to time. Their main requirement is good drainage and a nice sunny position in the garden. They can be grown either in the border or in decorative containers to be placed on the patio or by the front door. As they like an open sunny spot with free drainage, you need to add sharp grit to your soil if it is on the heavy side. This drainage is important if you intend to over winter Penstemons in the ground. If growing in containers a multi purpose compost (growing media) with added grit to aid the drainage is advisable. Mix the two before potting the plants into the container. To show Penstemons at their best and to create an eye catching display, plant about 450mm apart (18inches) soon you will have a large clump, but do not disturb them; once planted in their position they are best left alone. Penstemons can become woody and leggy if they are not pruned annually. So to keep plants neat and compact, give them a trim once the worst of the winter weather is over (usually in late April or early May depending which part of the country you are in). This timing ensures that the old stems are still there to shelter the new shoots from any damaging late frosts. Examine plants individually to see where the new shoots come from the base or are just appearing along the stems- then cut out all the old stems close to the base. Penstemons with few or no shoots growing from ground level should only have their stems shortened making the cuts just above the lowest set of healthy leaves. Apply a general fertilizer such as “Growmore” to the soil to encourage strong growth. Port Wine: Vigorous cultivar with large claret coloured flowers from summer well into autumn.